Greener Grass» Blog Archive » DAY 40. It is the last interview today and it is with Dan in Crystal. Dan is intelligent, with sense of humor and I can see why he must be a very good educator. My series of interviews couldn’t be finished with a nicer interview. We end up talking about how fantastic it could be if US was totally Spanish speaking. 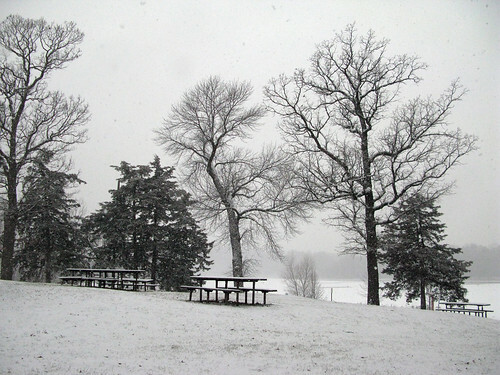 Regardless of snowing, Carole takes me to Wirth park where Dan’s grandparents and parents used to have picnics. There is also a monument for Finnish immigrants in Minnesota. Former Finntown is right around the corner. It used to be full of Finnish immigrants, but then there were Jews and Jews then sold the properties to black people. I wonder why can’t there be multiple ethnicity in one place… Former church of Finntown is for sale – if someones happens to need a church. When I get back to Danebo, my camera stand literally falls apart in my hands. It couldn’t have picked a better time, I assume. I feel emotional about the end of the interviews. If I’ve calculated correctly there were some 24 of them. It is not that I need more materials, but I could have continued just out of the habit. This entry was posted on Wednesday, November 24th, 2010 at 5:04 pm and is filed under Travel diary. You can follow any responses to this entry through the RSS 2.0 feed. You can leave a response, or trackback from your own site.